Could the best temp in Chiswick be onboard for the 50th Anniversary Special? Speculation. October 10, 2013 August 8, 2015 MataLeave a Comment on Could the best temp in Chiswick be onboard for the 50th Anniversary Special? Speculation. Has OK! 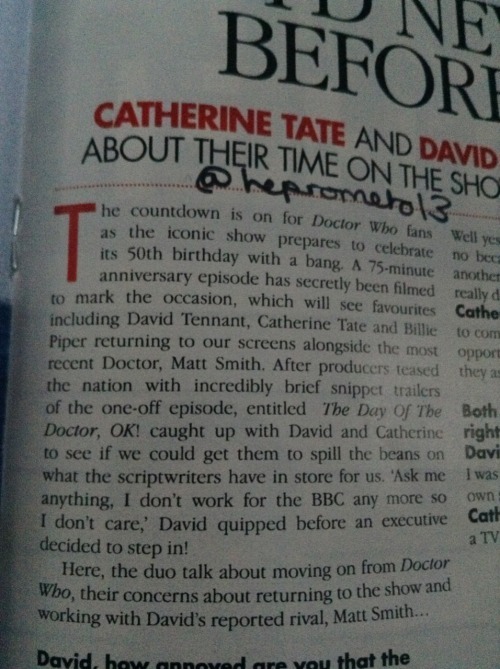 Magazine accidentally published a Spoiler about the upcoming Doctor Who 50th Anniversary Special? If it turns out to be true then BRILLIANT. Although, considering this has been the only source so far, it could be an oversight on the part of the magazine. The only other site speculating along with us is the Doctor Who TV blog. Surely if Catherine Tate was to reprise the role of Donna Noble, it would either be huge news or kept tightly under wraps- if it were a secret, anyway. Also, if Tate does return, could we also be seeing Freema Agyeman, who played the less favoured Martha Jones? Well it’s all speculation at this point, so only time will tell. I just hope we get to see a proper trailer soon. See the article below where Tate is listed among the names of those slated to feature in the special. Next Surviving One Direction’s Auckland Concert at the Vector Arena. A Jawkward Review.